Shred Size 1/13" x 9/16"
The Dahle 20392 High Capacity Shredder is just the tool to destroy large quantities of paper in a short amount of time. Plus, it can handle staples, paper clips, and CDs easily. This Professional Series strip-cut shredder has a 16" feed opening and can hold up to 50 gallons of waste. 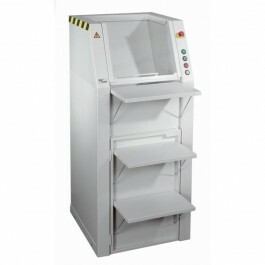 It features full electronic capabilities including such safety features as automatic shutoff when the door is open and auto reverse to prevent an overfeed. Housed in a wooden cabinet with casters, this sturdy machine is easy to move and position in its place of operation. This machine fits nicely in company mail rooms or any other centralized location where large amounts of shredded material is taken. 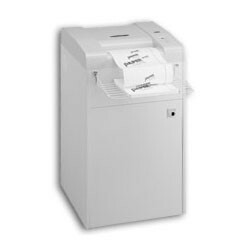 Shredding is fast and efficient with a speed of 22 feet per minute and a 50 gallon waste box for fewer disposals. The Dahle 20392 High Capacity shredder is German Engineered using the latest technology and finest materials. The end result is a quality machine and peace of mind in knowing your Dahle shredder will provide many years of trouble free operation.